Mitch Moreland - 1B TEX Fanduel: 2700 Draftkings: 3600 - Moreland will be seeing Collin McHugh at Globe Life Park in Arlington (Arlington, Texas) which ranks number 7 in runs scored. McHugh has an ERA against lefties of 4.73 with a wOBA of 0.350. In addition, he is really struggling on the road. His ERA on the road is 5.78 and his wOBA is 0.373. Moreland at home is money. His ISO is 0.286 and has a wOBA of 0.367. Moreland hits righties in a big way, with an ISO of 0.223 and has a wOBA of 0.334. This guy should crush it today if he is starting. Mike Napoli - 1B CLE Fanduel: 3400 Draftkings: 4100 - Napoliwill go against Tom Koehler at Progressive Field (Cleveland, Ohio). Koehler has an ERA against righties of 4.46 with a wOBA of 0.314. His ERA on the road is 4.48 and his wOBA is 0.336. Napoli at home is money. His ISO is 0.311 and has a wOBA of 0.436. Napoli hits righties extremely hard. His ISO is 0.241 and has a wOBA of 0.345. Jose Abreu - 1B CWS Fanduel: 3800 Draftkings: 4600 - Abreu is taking on Andrew Albers at Target Field (Minneapolis, Minnesota) which ranks number 3 in runs scored and number 14 in home runs allowed. This game is showing a high Over under of 10.5, so get ready for a lot of runs. Albers has an ERA against righties of 9.00 with a wOBA of 0.549. His ERA at home is 4.5 and his wOBA is 0.431. Through the last seven days, Abreu has scored 13 Fanduel fantasy points while his season average is 10. He has a batting average of 0.393 and a slugging percentage of 0.643 over that time. He also has hit 2 homeruns. Abreu on the road is great! His ISO is 0.140 and has a wOBA of 0.317. Carlos Santana - 1B CLE Fanduel: 3600 Draftkings: 4700 - Santana will be seeing Tom Koehler at Progressive Field (Cleveland, Ohio). Koehler has an ERA against switch hitters of 3.58 with a wOBA of 0.329. His ERA on the road is 4.48 and his wOBA is 0.336. During the prior 7 days Santana has scored 11.5 Fanduel fantasy points while his season average is 10.8. He has a batting average of 0.176 and a slugging percentage of 0.353 over that time. Santana at home is money. His ISO is 0.226 and has a wOBA of 0.346. Santana hits righties in a big way, with an ISO of 0.269 and has a wOBA of 0.366. Joe Mauer - 1B MIN Fanduel: 3300 Draftkings: 4000 - Mauer will face Anthony Ranaudo at Target Field (Minneapolis, Minnesota) which ranks number 3 in runs scored and number 14 in home runs allowed. The over under on this game is huge, at 10.5, so expect a lot of runs to be scored. Ranaudo has an ERA against lefties of 7.07 with a wOBA of 0.342. Also he has not done well on the road. His ERA on the road is 6.5 and his wOBA is 0.375. During the last week of games, Mauer has scored 10.3 Fanduel fantasy points while his season average is 9.3. He has a batting average of 0.304 and a slugging percentage of 0.435 over that time. Mauer at home is awesome and his ISO is 0.091 and has a wOBA of 0.327. Mauer hits righties in a big way, with an ISO of 0.136 and has a wOBA of 0.351. He should score some big points for you today if he is starting. 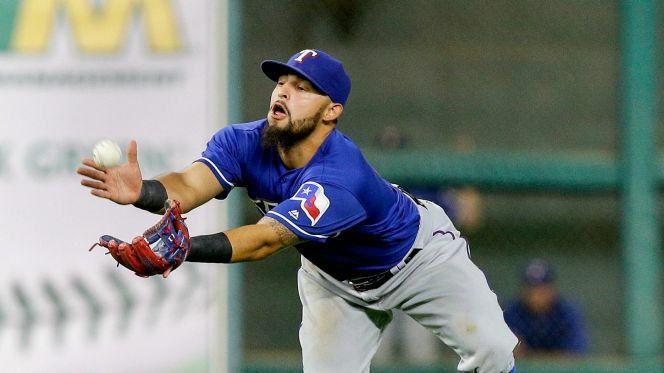 Rougned Odor - 2B TEX Fanduel: 3800 Draftkings: 5000 - Odor will go against Collin McHugh at Globe Life Park in Arlington (Arlington, Texas) which ranks number 7 in runs scored. McHugh has an ERA against lefties of 4.73 with a wOBA of 0.350. He's playing poorly big time on the road. His ERA on the road is 5.78 and his wOBA is 0.373. Over the last 7 days Odor has scored 22.7 Fanduel fantasy points while his season average is 11.4. He has a batting average of 0.346 and a slugging percentage of 0.885 over that time. He also has hit 4 homeruns. Odor at home crushes it. He has an ISO of 0.248 and has a wOBA of 0.355. Odor hits righties in a big way, with an ISO of 0.240 and has a wOBA of 0.339. If you see him starting, try to roster him. Brian Dozier - 2B MIN Fanduel: 4100 Draftkings: 5000 - Dozier will battle Anthony Ranaudo at Target Field (Minneapolis, Minnesota) which ranks number 3 in runs scored and number 14 in home runs allowed. This game is showing a high Over under of 10.5,Ranaudo has an ERA against righties of 10.97 with a wOBA of 0.403. He's playing poorly big time on the road. His ERA on the road is 6.5 and his wOBA is 0.375. During the last week of games, Dozier has scored 19.6 Fanduel fantasy points while his season average is 12.8. He has a batting average of 0.321 and a slugging percentage of 0.786 over that time. He also has hit 4 homeruns. Dozier at home0.245 and has a wOBA of 0.353. Dozier hits righties very hard. His ISO is 0.246 and has a wOBA of 0.355. Jason Kipnis - 2B CLE Fanduel: 3700 Draftkings: 4900 - Kipnis will be taking on Tom Koehler at Progressive Field (Cleveland, Ohio). Koehler has an ERA against lefties of 3.58 with a wOBA of 0.329. His ERA on the road is 4.48 and his wOBA is 0.336. During the last week of games, Kipnis has scored 15.7 Fanduel fantasy points while his season average is 11.3. He has a batting average of 0.286 and a slugging percentage of 0.571 over that time. He also has hit 2 homeruns. Kipnis at home is incredible. His ISO is 0.223 and has a wOBA of 0.368. Kipnis hits righties in a big way, with an ISO of 0.205 and has a wOBA of 0.351. After a 3 hit outting yesterday, Josh Harrison - 2B PIT Fanduel: 2800 Draftkings: 3500 - Harrison will go against Chase Anderson at PNC Park (Pittsburgh, Pennsylvania). Anderson has an ERA against righties of 5.27 with a wOBA of 0.394. Also he has been playing poorly on the road. His ERA on the road is 6 and his wOBA is 0.370. Through the last seven days, Harrison has scored 9.9 Fanduel fantasy points while his season average is 8.5. He has a batting average of 0.296 and a slugging percentage of 0.333 over that time. DJ LeMahieu - 2B COL Fanduel: 4100 Draftkings: 5000 - LeMahieu will be seeing Archie Bradley at Coors Field (Denver, Colorado) which ranks number 1 in runs scored and number 2 in home runs allowed. This game has a high over under of 12, so expect a high scoring game. Bradley has an ERA against righties of 4.57 with a wOBA of 0.279. His ERA on the road is 4.07 and his wOBA is 0.326. During the past week LeMahieu has scored 14.5 Fanduel fantasy points while his season average is 11.5. He has a batting average of 0.320 and a slugging percentage of 0.480 over that time. LeMahieu at home is awesome and his ISO is 0.219 and has a wOBA of 0.466. LeMahieu hits righties in a big way, with an ISO of 0.145 and has a wOBA of 0.385. Adrian Beltre - 3B TEX Fanduel: 3500 Draftkings: 4600 - Beltre is going against Collin McHugh at Globe Life Park in Arlington (Arlington, Texas) which ranks number 7 in runs scored. McHugh has an ERA against righties of 4.87 with a wOBA of 0.359. In addition he really has been pretty weak on the road. His ERA on the road is 5.78 and his wOBA is 0.373. During the past week Beltre has scored 20.9 Fanduel fantasy points while his season average is 11.2. He has a batting average of 0.391 and a slugging percentage of 0.826 over that time. He also has hit 3 homeruns. Beltre at home0.202 and has a wOBA of 0.384. Beltre hits righties very hard. His ISO is 0.183 and has a wOBA of 0.337. Todd Frazier - 3B CWS Fanduel: 4100 Draftkings: 4900 - Frazier will go against Andrew Albers at Target Field (Minneapolis, Minnesota) which ranks number 3 in runs scored and number 14 in home runs allowed. There's a high over under on this game, 10.5, so expect a high scoring game. Albers has an ERA against righties of 9.00 with a wOBA of 0.549. His ERA at home is 4.5 and his wOBA is 0.431. During the past week Frazier has scored 11.2 Fanduel fantasy points while his season average is 11. He has a batting average of 0.160 and a slugging percentage of 0.520 over that time. He also has hit 3 homeruns. Frazier on the road is money. His ISO is 0.259 and has a wOBA of 0.318. Frazier hits lefties very hard. His ISO is 0.315 and has a wOBA of 0.335. Trevor Plouffe - 3B MIN Fanduel: 3100 Draftkings: 3800 - Plouffe is facing Anthony Ranaudo at Target Field (Minneapolis, Minnesota) which ranks number 3 in runs scored and number 14 in home runs allowed. 10.5, so expect a lot of runs to be scored. Ranaudo has an ERA against righties of 10.97 with a wOBA of 0.403. In addition, he is really struggling on the road. His ERA on the road is 6.5 and his wOBA is 0.375. Throughout the last 7 days Plouffe has scored 12.6 Fanduel fantasy points while his season average is 8.8. He has a batting average of 0.276 and a slugging percentage of 0.483 over that time. He also has hit 2 homeruns. Nolan Arenado - 3B COL Fanduel: 4500 Draftkings: 5600 - Arenado will be pitted against Archie Bradley at Coors Field (Denver, Colorado) which ranks number 1 in runs scored and number 2 in home runs allowed. The over under on this game is huge, at 12, so I think you should expect a lot of fantasy points being scored. Bradley has an ERA against righties of 4.57 with a wOBA of 0.279. His ERA on the road is 4.07 and his wOBA is 0.326. During the last week of games, Arenado has scored 20 Fanduel fantasy points while his season average is 13.6. He has a batting average of 0.458 and a slugging percentage of 0.875 over that time. He also has hit 2 homeruns. Arenado at home is awesome and his ISO is 0.352 and has a wOBA of 0.436. Arenado hits righties big time, to the tune of an ISO of 0.299 and has a wOBA of 0.397. David Freese - 3B PIT Fanduel: 2800 Draftkings: 2900 - Freese will be pitted against Chase Anderson at PNC Park (Pittsburgh, Pennsylvania). Anderson has an ERA against righties of 5.27 with a wOBA of 0.394. He really isn't doing well on the road. His ERA on the road is 6 and his wOBA is 0.370. Freese at home crushes it. He has an ISO of 0.117 and has a wOBA of 0.331. Freese hits righties very hard. His ISO is 0.126 and has a wOBA of 0.318. If you see him starting, try to roster him. Elvis Andrus - SS TEX Fanduel: 2400 Draftkings: 3700 - Andrus faces Collin McHugh at Globe Life Park in Arlington (Arlington, Texas) which ranks number 7 in runs scored. McHugh has an ERA against righties of 4.87 with a wOBA of 0.359. He's playing poorly big time on the road. His ERA on the road is 5.78 and his wOBA is 0.373. During the last week of games, Andrus has scored 12.5 Fanduel fantasy points while his season average is 9.3. He has a batting average of 0.278 and a slugging percentage of 0.333 over that time. Andrus at home is great! His ISO is 0.127 and has a wOBA of 0.325. Really try to get him into your lineups. Tim Anderson - SS CWS Fanduel: 3100 Draftkings: 4000 - Anderson will be facing Andrew Albers at Target Field (Minneapolis, Minnesota) which ranks number 3 in runs scored and number 14 in home runs allowed. There over under on this game is pretty big at 10.5,Albers has an ERA against righties of 9.00 with a wOBA of 0.549. His ERA at home is 4.5 and his wOBA is 0.431. Anderson hits lefties very hard. His ISO is 0.164 and has a wOBA of 0.368. Tyler Saladino - SS CWS Fanduel: 2800 Draftkings: 3800 - Saladino will be taking on Andrew Albers at Target Field (Minneapolis, Minnesota) which ranks number 3 in runs scored and number 14 in home runs allowed. 10.5, so expect a lot of runs to be scored. Albers has an ERA against righties of 9.00 with a wOBA of 0.549. His ERA at home is 4.5 and his wOBA is 0.431. Throughout the last 7 days Saladino has scored 8.4 Fanduel fantasy points while his season average is 7.6. He has a batting average of 0.261 and a slugging percentage of 0.478 over that time. Saladino hits lefties very hard. His ISO is 0.091 and has a wOBA of 0.322. Francisco Lindor - SS CLE Fanduel: 3500 Draftkings: 4600 - Lindor will face Tom Koehler at Progressive Field (Cleveland, Ohio). Koehler has an ERA against switch hitters of 3.58 with a wOBA of 0.329. His ERA on the road is 4.48 and his wOBA is 0.336. Over the last week Lindor has scored 13.8 Fanduel fantasy points while his season average is 10.9. He has a batting average of 0.538 and a slugging percentage of 0.731 over that time. Lindor at home is awesome and his ISO is 0.167 and has a wOBA of 0.389. Lindor hits righties in a big way, with an ISO of 0.152 and has a wOBA of 0.354. Jordy Mercer - SS PIT Fanduel: 2500 Draftkings: 3200 - Mercer is taking on Chase Anderson at PNC Park (Pittsburgh, Pennsylvania). Anderson has an ERA against righties of 5.27 with a wOBA of 0.394. Also he isn't getting it done on the road. His ERA on the road is 6 and his wOBA is 0.370. Mercer at home crushes it. He has an ISO of 0.123 and has a wOBA of 0.341. Jonathan Lucroy - C TEX Fanduel: 3400 Draftkings: 4800 - Lucroywill go against Collin McHugh at Globe Life Park in Arlington (Arlington, Texas) which ranks number 7 in runs scored. McHugh has an ERA against righties of 4.87 with a wOBA of 0.359. Also he isn't getting it done on the road. His ERA on the road is 5.78 and his wOBA is 0.373. Lucroy has scored 15.7 Fanduel fantasy points while his season average is 10.3. He has a batting average of 0.615 and a slugging percentage of 0.846 over that time. Lucroy at home0.269 and has a wOBA of 0.412. Lucroy hits righties big time, to the tune of an ISO of 0.195 and has a wOBA of 0.376. Kurt Suzuki - C MIN Fanduel: 2700 Draftkings: 2900 - Suzuki is facing Anthony Ranaudo at Target Field (Minneapolis, Minnesota) which ranks number 3 in runs scored and number 14 in home runs allowed. This could be a shoot out with an over under of 10.5, so expect a lot of runs to be scored. Ranaudo has an ERA against righties of 10.97 with a wOBA of 0.403. In addition, he is really struggling on the road. His ERA on the road is 6.5 and his wOBA is 0.375. Nick Hundley - C COL Fanduel: 3500 Draftkings: 4300 - Hundley will be facing Archie Bradley at Coors Field (Denver, Colorado) which ranks number 1 in runs scored and number 2 in home runs allowed. There's a high over under on this game, 12, so I think you should expect a lot of fantasy points being scored. Bradley has an ERA against righties of 4.57 with a wOBA of 0.279. His ERA on the road is 4.07 and his wOBA is 0.326. During the past week Hundley has scored 20.2 Fanduel fantasy points while his season average is 8.9. He has a batting average of 0.250 and a slugging percentage of 0.750 over that time. He also has hit 2 homeruns. Mike Zunino - C SEA Fanduel: 2900 Draftkings: 2800 - Zunino squares off verse Matt Shoemaker at Safeco Field (Seattle, Washington). Shoemaker has an ERA against righties of 3.82 with a wOBA of 0.321. His ERA on the road is 4.72 and his wOBA is 0.334. Zunino at home is great! His ISO is 0.610 and has a wOBA of 0.515. Zunino hits righties big time, to the tune of an ISO of 0.362 and has a wOBA of 0.391. Alex Avila - C CWS Fanduel: 2500 Draftkings: 3300 - Avila will be facing Andrew Albers at Target Field (Minneapolis, Minnesota) which ranks number 3 in runs scored and number 14 in home runs allowed. There's a high over under on this game, 10.5, so get ready for a lot of runs. Albers has an ERA against lefties of 2.70 with a wOBA of 0.263. His ERA at home is 4.5 and his wOBA is 0.431. Over the last 7 days Avila has scored 7.7 Fanduel fantasy points while his season average is 7. He has a batting average of 0.154 and a slugging percentage of 0.385 over that time. Avila hits lefties extremely hard. His ISO is 0.250 and has a wOBA of 0.478. Really try to get him into your lineups. Miguel Sano - OF MIN Fanduel: 3000 Draftkings: 3700 - Sano will be seeing Anthony Ranaudo at Target Field (Minneapolis, Minnesota) which ranks number 3 in runs scored and number 14 in home runs allowed. The over under on this game is huge, at 10.5, so expect a lot of runs to be scored. Ranaudo has an ERA against righties of 10.97 with a wOBA of 0.403. In addition, he is really struggling on the road. His ERA on the road is 6.5 and his wOBA is 0.375. Sano hits righties very hard. His ISO is 0.209 and has a wOBA of 0.324. His matchup it too much to overlook. Carlos Beltran - OF TEX Fanduel: 3400 Draftkings: 3900 - Beltran will go against Collin McHugh at Globe Life Park in Arlington (Arlington, Texas) which ranks number 7 in runs scored. McHugh has an ERA against switch hitters of 4.73 with a wOBA of 0.350. In addition he really has been pretty weak on the road. His ERA on the road is 5.78 and his wOBA is 0.373. Over the last 7 days Beltran has scored 21.3 Fanduel fantasy points while his season average is 10.3. He has a batting average of 0.450 and a slugging percentage of 0.850 over that time. He also has hit 2 homeruns. Beltran at home is incredible. His ISO is 0.262 and has a wOBA of 0.384. Beltran hits righties big time, to the tune of an ISO of 0.208 and has a wOBA of 0.328. Look for a big game. David Dahl - OF COL Fanduel: 4100 Draftkings: 4900 - Dahl will be seeing Archie Bradley at Coors Field (Denver, Colorado) which ranks number 1 in runs scored and number 2 in home runs allowed. This game is showing a high Over under of 12, so expect a high scoring game. Bradley has an ERA against lefties of 5.48 with a wOBA of 0.408. His ERA on the road is 4.07 and his wOBA is 0.326. Dahl at home is awesome and his ISO is 0.200 and has a wOBA of 0.409. Dahl hits righties very hard. His ISO is 0.243 and has a wOBA of 0.403. He has a nice matchup today. Ian Desmond - OF TEX Fanduel: 3500 Draftkings: 4200 - Desmond is taking on Collin McHugh at Globe Life Park in Arlington (Arlington, Texas) which ranks number 7 in runs scored. McHugh has an ERA against righties of 4.87 with a wOBA of 0.359. on the road. His ERA on the road is 5.78 and his wOBA is 0.373. Over the last 7 days Desmond has scored 12.5 Fanduel fantasy points while his season average is 11.8. He has a batting average of 0.304 and a slugging percentage of 0.435 over that time. Desmond at home is awesome and his ISO is 0.182 and has a wOBA of 0.383. Desmond hits righties big time, to the tune of an ISO of 0.174 and has a wOBA of 0.333. You need to get him in your lineups today. Charlie Blackmon - OF COL Fanduel: 4600 Draftkings: 5400 - Blackmon goes against Archie Bradley at Coors Field (Denver, Colorado) which ranks number 1 in runs scored and number 2 in home runs allowed. 12,Bradley has an ERA against lefties of 5.48 with a wOBA of 0.408. His ERA on the road is 4.07 and his wOBA is 0.326. Blackmon at home is awesome and his ISO is 0.191 and has a wOBA of 0.376. Blackmon hits righties very hard. His ISO is 0.254 and has a wOBA of 0.386. Carlos Gonzalez - OF COL Fanduel: 4200 Draftkings: 5000 - Gonzalez will go against Archie Bradley at Coors Field (Denver, Colorado) which ranks number 1 in runs scored and number 2 in home runs allowed. This game is showing a high Over under of 12, so expect a lot of runs to be scored. Bradley has an ERA against lefties of 5.48 with a wOBA of 0.408. His ERA on the road is 4.07 and his wOBA is 0.326. Gonzalez at home is incredible. His ISO is 0.316 and has a wOBA of 0.437. Gonzalez hits righties extremely hard. His ISO is 0.222 and has a wOBA of 0.384. Avisail Garcia - OF CWS Fanduel: 2700 Draftkings: 3600 - Garcia will face Andrew Albers at Target Field (Minneapolis, Minnesota) which ranks number 3 in runs scored and number 14 in home runs allowed. The over under on this game is huge, at 10.5, so expect a lot of runs to happen! Albers has an ERA against righties of 9.00 with a wOBA of 0.549. His ERA at home is 4.5 and his wOBA is 0.431. Garcia hits lefties very hard. His ISO is 0.184 and has a wOBA of 0.341.